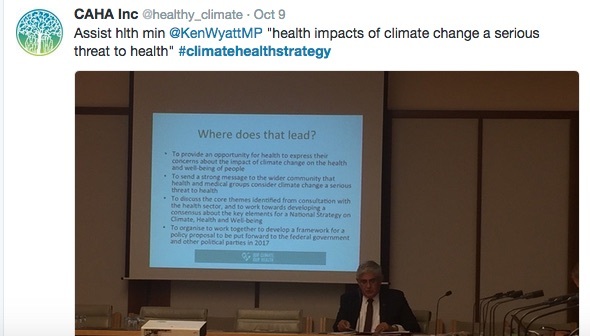 Minister Ken Wyatt: showing "genuine interest"
An historic meeting of “health heavyweights” took place in Canberra this week with the aim of generating some long overdue action on a national climate and health strategy (as previewed at Croakey). 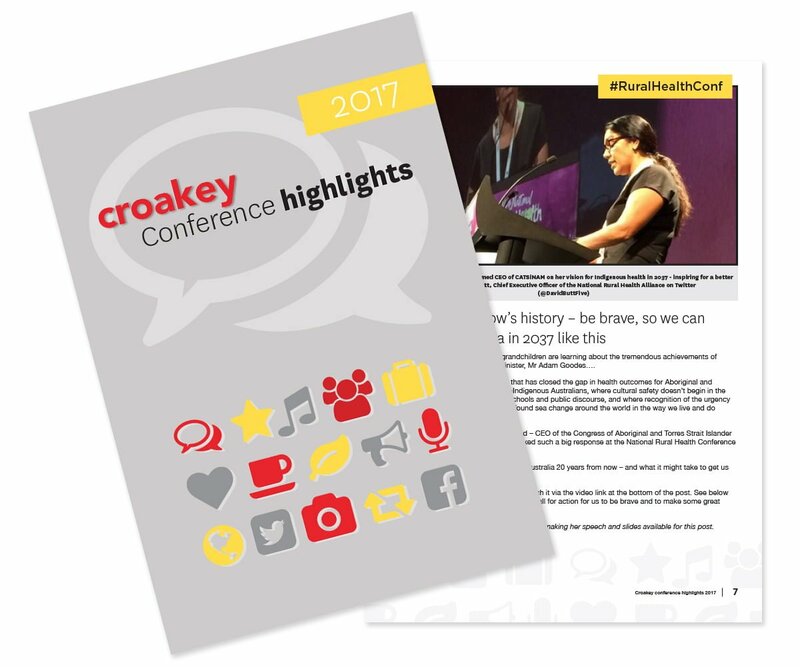 Jennifer Doggett reports on the event for the Croakey Conference News Service. The World Health Organisation calls climate change “among the greatest health risks of the 21st Century”. But it’s an issue that has barely made it onto the radar of the Australian Government. 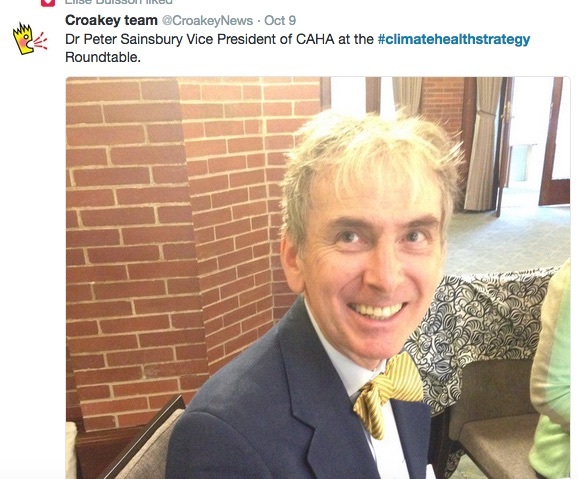 This looks like changing after the Climate and Health Alliance (CAHA) brought together an impressive group of health heavyweights for a ‘historic meeting’ to discuss how to progress a climate and health strategy for Australia. The group included a Minister, shadow minister, party leader, senior bureaucrats, medical and nursing leaders and several CEOs of health organisations. 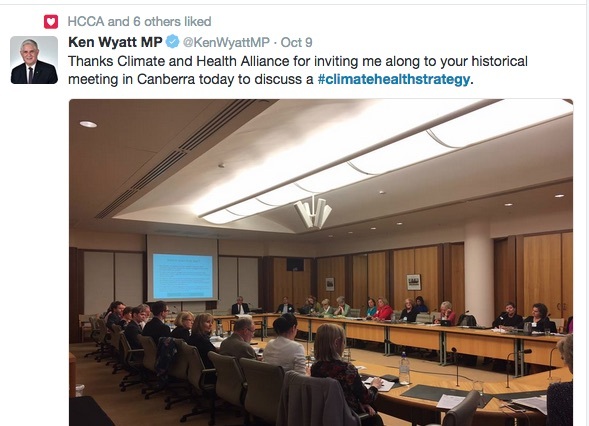 The fact that so many high powered health leaders gave up a day in a busy sitting week in Canberra to discuss the health impacts of climate change reflects the importance of this issue to the health sector and the community as a whole. The groups represented came from the broad spectrum of the health system and included: the Australian Healthcare and Hospitals Association; Australian Society for Medical Research; Australian Medical Students’ Association; the Australian College of Nursing; the Australasian College for Emergency Medicine; the Australasian College of Health Services Management; the Australian Council of Social Services; the Australian Faculty of Public Health Medicine; the Australian Health Promotion Association; the National Rural Health Alliance; the Public Health Association of Australia; and the Royal Australasian College of General Practitioners. There were also some individuals from various universities and think tanks with expertise in relevant areas who attended. While attendance at the meeting was impressive, there were some key groups and individuals who were not present for some or all of the day. The AMA representatives were able to attend the morning session, but missed the afternoon discussion due to other commitments. Unfortunately, the Secretary of the Department of Health, Martin Bowles, was not able attend, but the Department was represented at a high level by the Chief Nursing and Midwifery Officer Debra Thom and Deputy Chief Medical Officer Dr Tony Hobbs. While none of the Indigenous organisations invited were able to attend this gathering, it is an issue on which their involvement will be crucial in the future. 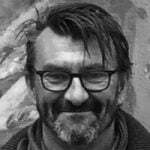 This is both because climate change is likely to disproportionately affect Indigenous people (both in Australia and globally) and also because the proposed national strategy could greatly benefit from Indigenous knowledge and understanding of the inter-dependency of climate, environment and health. 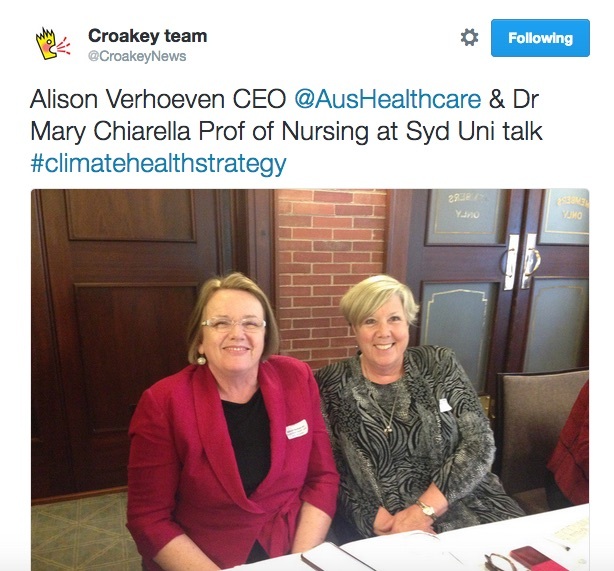 As reported earlier in Croakey, the apparent apathy of the Government about the health impacts of climate change is not shared by the health profession whose members appear to have a greater understanding of the need for action on this issue. Preliminary findings from an ongoing survey of health professionals found 98 per cent agreed that Australia needs a national strategy on climate, health and well-being. These findings highlight the importance of ongoing dialogue between political leaders, policy makers and the health sector to ensure the gap between their different understandings of the importance of this issue is narrowed. The CAHA event involved a morning session where health leaders met with political leaders and an afternoon roundtable discussion on the development of a national climate and health strategy. At Parliament House, participants met with representatives of the major political parties, including Assistant Health Minister Ken Wyatt MP, Shadow Health Minister Catherine King MP and Leader of the Greens, Richard di Natale. Participants reported that the discussions with politicians were positive and they were, overall, impressed with the level of interest and engagement from the three political leaders. A number of people commented on the genuine interest shown by Ken Wyatt and his willingness to learn more about the issue. Catherine King also impressed with her commitment to take the issues being discussed back to the Labor partyroom. However, it was pointed out by others that largely short-term financial and media issues drive the policies of the two major parties and that even well intentioned and committed health portfolio holders have little ability to change this focus. 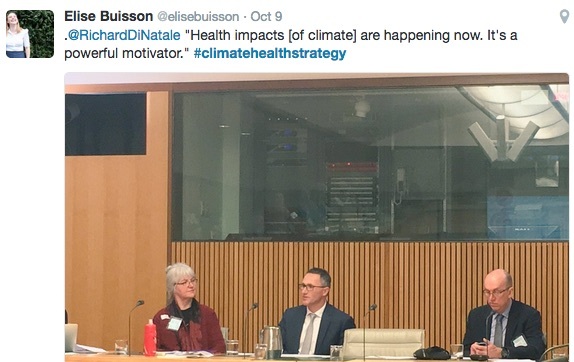 Unsurprisingly, Senator Richard di Natale was seen as having the most in-depth understanding of the many ways in which climate change will impact on the health sector and the health of the community. The Greens in general were seen as important allies in raising awareness of the issue in Parliament, particularly in their current role sharing the balance of power in the Senate. The afternoon’s discussion centred on the development of a national strategy on the health impacts of climate change. Overall, the group expressed strong support for the development of a strategy and a sense of urgency about the need for this to be done either with or without the support of government. As would be expected with such an experienced group of health leaders, the discussion was high level, complex and nuanced with both a ‘big picture’ strategic approach outlined and specific recommendations made for individual lobbying and advocacy strategies. 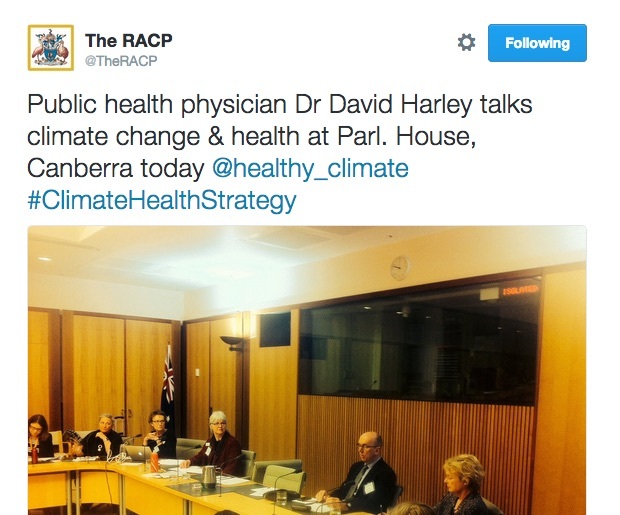 A central theme of the discussions was the important role of health professionals in advocating for action to address the health effects of climate change. This role was seen as arising from the respected role that health professionals have in our community and their direct contact with the general community. 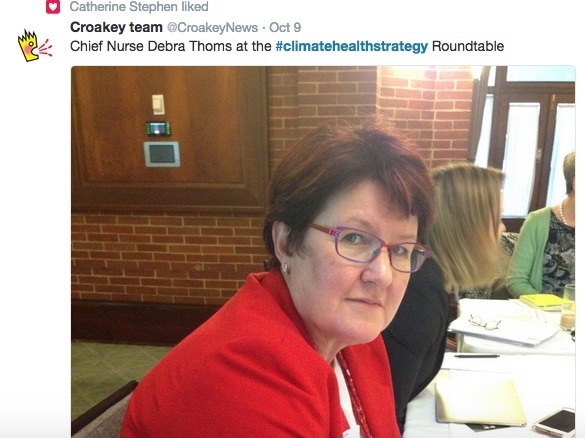 Many people commented that as a trusted group in the community health professionals could use their influence to change the views of politicians and policy makers on climate change. The role of health professionals in training others was also highlighted, with some suggestions made that the health impacts of climate change should be included in the undergraduate and continuing professional education of health providers. 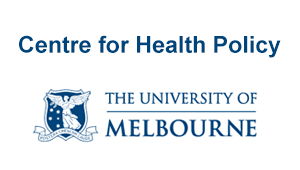 The attendance of three medical colleges (representing physicians, emergency medicine and general practice) at the meeting was welcomed, although the group noted that there were also a number of medical colleges not represented, including those whose areas are likely to be directly impacted by climate change (for example the Royal Australian and New Zealand College of Psychiatrists). Participants discussed the need for those colleges already engaged in this issue to work with other parts of the medical profession to educate them about the need for their involvement. The importance of post-graduate and continuing professional education on the health impacts of climate change were also recognised. 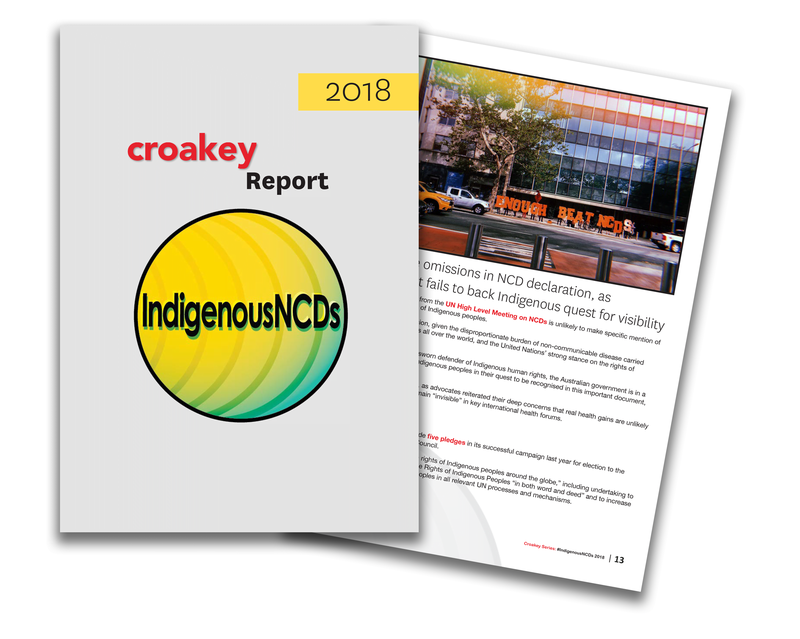 Some gaps were identified, including the absence of the medical deans and the Australian Medical Council, whose involvement participants noted would be needed in order to address this issue. 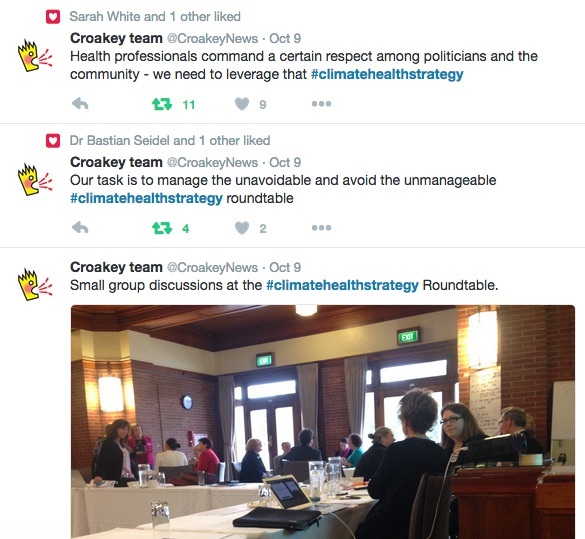 The role of health professionals in engaging the general community on climate change was also mentioned as an important strategy. The importance of building resilience within the health sector was highlighted to ensure that both people and services are prepared to deal with threats due to climate change. 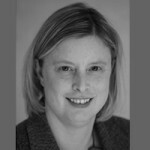 The development of a national resilience standard was mentioned with CAHA’s executive director, Fiona Armstrong, commenting that CAHA has already undertaken some work on this issue and provided a draft standard to the Australian Commission on Safety and Quality Health Care. Many participants also stressed the need to look internally at the health sector and how it deals with health emissions. 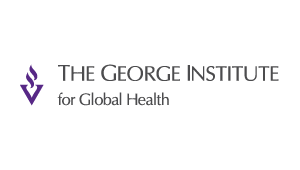 Recognising success stories, such as the Global Green and Healthy Hospitals initiative, was seen as an important way to highlight the action being taken by the health sector to address climate change. The need for increased data collection and research on the health impacts of climate change was raised a number of times at the meeting. 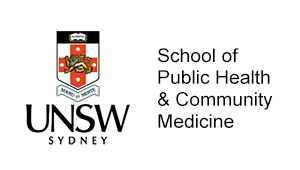 While there is extensive data available indicating the serious health impacts of climate change, participants noted that there is also a need to continue to build evidence in this area, in particular to highlight the specific health impacts of climate change in the Australian setting. Data is also needed for policy development and health infrastructure strategies, including research into systems capacity for dealing with climate change impacts in the e-health sector. CSIRO and AIHW were identified as possible sources of data on this issue. Another suggestion was made to seek funding from the Medical Research Future Fund, when it is operational, to fund additional research in this area. Participants also discussed the need to promote cross-sector research in this area, e .g projects which draw on both climate change research and medical research methodologies. Many participants stressed the need to recognise and draw on the experience of other countries in combating the health impacts of climate change. 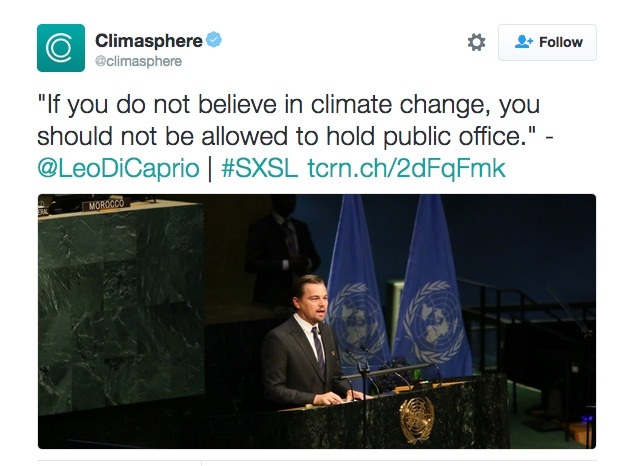 Australia was seen as a long way behind many other countries in this area, and this is particularly concerning given our status as a developed country and our geographic location in the Pacific Ocean, with many neighbouring nations directly threatened by rising sea levels due to global warming. One participant reported feeling embarrassed when representing Australia at international meetings on this issue to report our lack of activity in this area. Others highlighted the much higher priority placed on climate change and health issues by other countries. 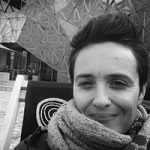 For both ethical and practical reasons, participants felt Australia needs to do more within our region to address the health impacts of climate change. Ethical, because we should see ourselves as part of a global citizenry and practical because we are likely to end up with refugee from neighbouring Pacific islands if they become uninhabitable due to climate change. 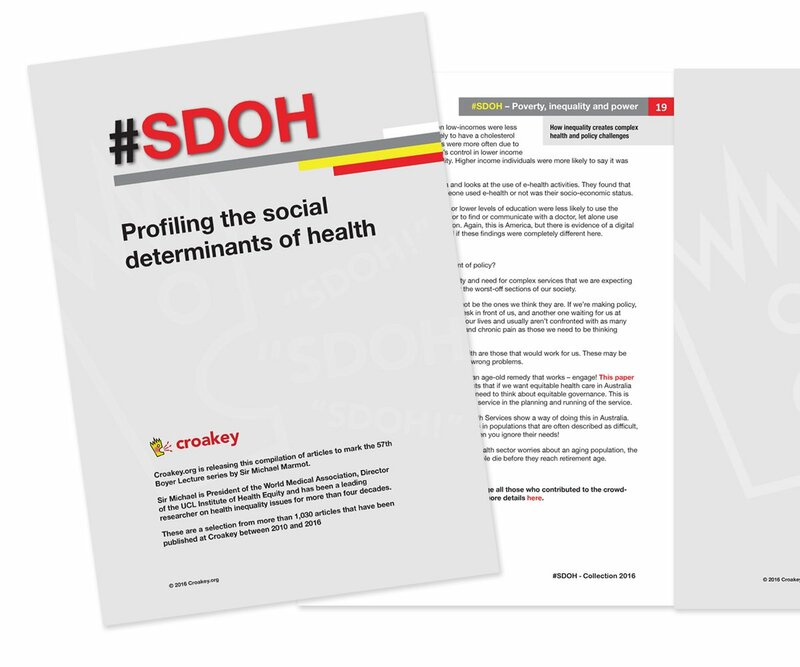 One specific example provided of how governments can support the health sector to address and reduce the health impacts of climate change was the Sustainable Development Unit (SDU) in the UK. The SDU was established to help organisations across health and care embed and promote sustainable development in order to reduce emissions, save money and improve the health of people and communities. At an environmental level this includes addressing issues such as energy, travel, waste, procurement, water, infrastructure adaptation and buildings. Key relevant features of the SDU identified was that it is an independent unit operating outside of any other health department or organisation and is thus able to develop its own expertise and advise other services and organisations across the health system. There was a strong commitment at the meeting to continue and strengthen the efforts of the health sector in advocating for increased efforts to raise awareness of the health impacts of climate change. Maintaining political presence and supporting public awareness through advocacy and education was identified as a key strategy. 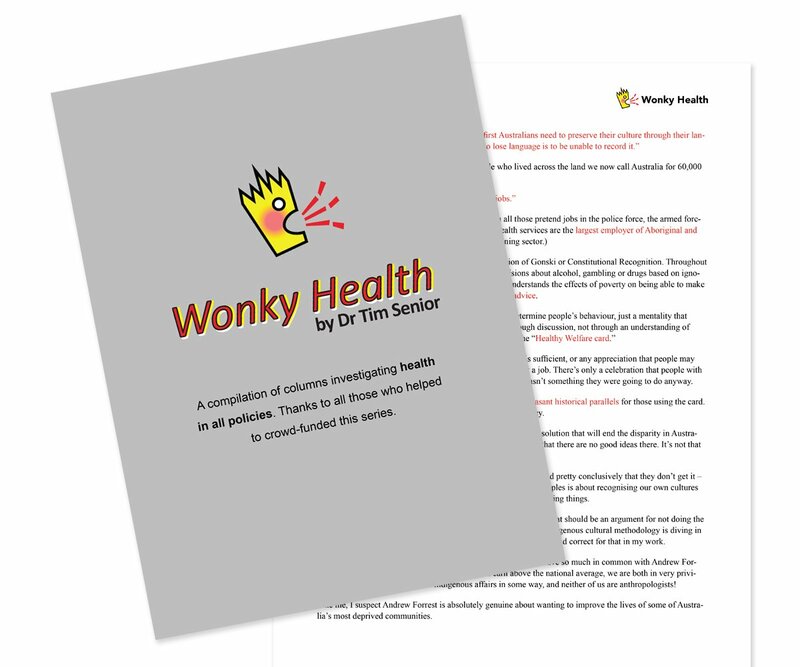 There was an extensive discussion about how to progress advocacy efforts and recognition that this would involve challenging the thinking in many areas of the health system and in government. 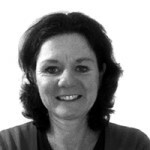 The need for clear and concise messaging that targets specific audiences with messages designed for them was identified. Specific suggestions made to support advocacy efforts included the development of a tool kit for medical colleges and other health organisations to equip members to advocate at local level with MPs. The possibility of lobbying for either a Senate Inquiry or a Productivity Commission (PC) Inquiry was raised, although it was also noted that inquiries of this nature should be seen as one of a broad range of strategies rather than as a stand-alone goal. 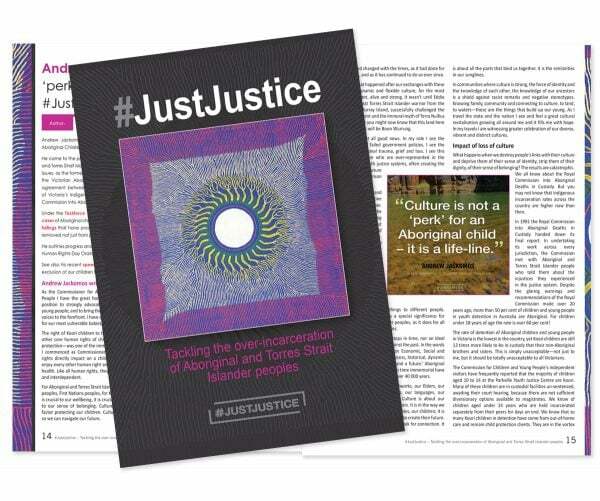 The benefits of both types of inquiry were discussed with participants suggesting that a PC inquiry would have broader appeal politically and a longer ‘shelf life’ than a Senate Inquiry. Key issues raised in relation to an inquiry included the need for whoever undertakes such a review to have the right skill set to understand the complex issues involved. One risk mentioned was the possibility that climate change could be framed as a productivity debate that focuses on narrow economic arguments and ignores the broader impacts of climate change on health and well-being. The appropriate balance between prevention and adaptation was extensively discussed at the Roundtable with most participants agreeing that both approaches were needed in some measure. It was noted that many national governments, including that of Australia, see climate change as an adaptation issue and that therefore advocacy efforts needed to focus on the important role of prevention. Participants noted that the language used in advocacy on this issue needed to reflect the need for prevention, while also recognising that in some cases adaptation would be required. One challenge identified was the need to involve multiple sectors outside of the health system as climate change impacts upon a broad range of areas, including resources, transport and foreign aid. Another was promoting the value of prevention versus reaction on both a population vs individual level. The short-term focus on politics was seen as a barrier to achieving this aim. Participants suggested a multi-factored approach to advocacy, working at both the community and political levels, to shift opinions so that public opinion could influence politicians who in turn would influence the community. Support was provided for the development of phase three of CAHA’s ongoing comprehensive climate and health campaign. With Phase One completed (meetings with key allies and the release of a discussion paper) and Phase Two ongoing (training of health professionals in climate change lobbying and advocacy), this next stage involves a political and media campaign directed by a core organising group. Participants at the Roundtable agreed to form a broad reference group to inform development of Phase Three of the strategy. 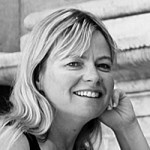 Many also volunteered ‘in kind’ support for the campaign, such as meeting facilities and assistance with the research and preparation of papers. Participants suggested that the strategy should be designed so that it could be useful and support ongoing advocacy and action regardless of whether it ultimately receives government support. With support, CAHA aims to employ one person full time to manage the campaign and to coordinate the range of different strategies identified as important in order to influence politicians and policy makers. 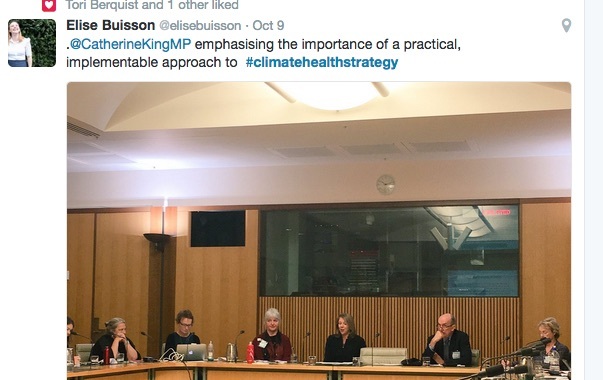 This effort, combined with the expertise and support of a broad spectrum of health leaders, should ensure the campaign is successful in persuading politicians of our long overdue need for a climate and health strategy. • Thanks to John Englart for compiling this Storify of tweets from the day – have a read. 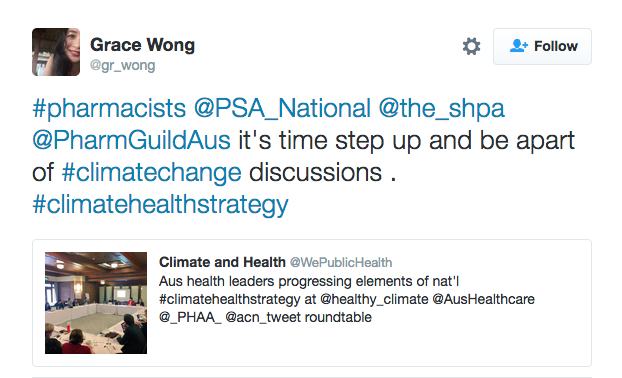 Read the #ClimateHealthStrategy Twitter transcript. 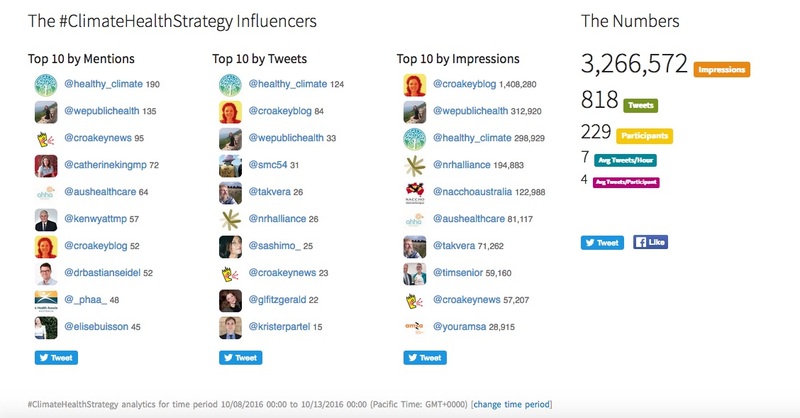 Thanks to all who shared the #ClimateHealthNews – Twitter analytics below. A new international survey involving members of the American Thoracic Society revealed most of the physicians around the world believe that climate change is real and has a direct negative impact to patient care.